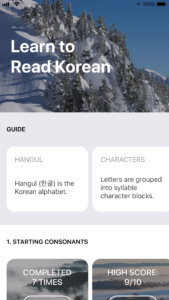 I’ve just released my Learn to read Korean app for iPhone. It uses a number of child View Controllers in the home screen. While child View Controllers are not a new thing, it was a new experience for me, and I greatly recommend them to reduce the clutter of your View Controllers. The main view controller consists of a vertical UIScrollView and multiple horizontal scrolling UICollectionViews below. While it’s possible to do it all in one massive View Controller, it’s much better to delegate UICollectionView events to their individual child View Controllers. The good news is that using child UIViewControllers is super easy. You can use your Storyboard or do it programmatically in your UIViewController files. I opted for the latter as I find it easier to reproduce across Xcode projects. All you need to do to add a child View Controller is below. I included an optional constraints section. With multiple child VCs (each handling their own UICollectionView events), the code base becomes manageable. In each child View Controller, you can handle customization, such as background color, UILabels, UIButtons, etc. That’s all I wanted to share for today. Don’t be afraid of using child View Controllers to break up your massive View Controllers! This entry was posted in Programming and tagged childviewcontroller, ios, iphone, parentviewcontroller, swift, uikit, uiviewcontroller, xcode on February 8, 2018 by Rex. Working on a small side project, I wanted to display images in my view controller view at full device width in a vertical scrolling view. Sounds simple right? The good news is that it is. While you may want to use UITableView for more control, using UIStackView is a simpler way to get up and running fast. For my sample code, I opted to do it programmatically as it’s easier to copy & paste code than explain what constraints to add in Xcode. Also note that the code presented here is a proof of concept, quick and dirty example (not intended for production). Hope this helps you if you’re trying to throw together a quick prototype of vertically scrolling images in iOs. This entry was posted in Programming and tagged images, ios, scrolling, swift, UIScrollView, UIStackView on January 16, 2018 by Rex. There is endless boba in Los Angeles. I currently live in Ktown where every block seems to have a boba shop, a patbingsu shop, or both. It’s hard to rank boba joints, because the drink customization (sugar level) and drinks on the same menu vary so much. There could be a big difference between the house specialty (let’s say rose milk tea) and the random drink (almond milk tea). I value the quality of the ingredients (made in house with real things instead of powder), the freshness of the pearls (boba), and the flavor profile (not mind-numbingly sweet). I’ve tried many dozens of boba joints in LA, and I usually order large, 50% sugar, and less ice. Below are places that have consistently good drinks with a sample recommended order. Not every order is your standard PMT (pearl milk tea). While I don’t inherently favor chains, I’ve found that big chains from Asia are more reliable and consistent with the boba freshness. Gong Cha 9 out of 10 times will have fresh boba, whereas your average LA boba shop will probably not have fresh boba. 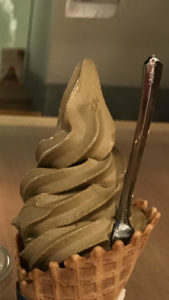 This entry was posted in Food and tagged boba, la, pmt, tea, tearex on December 29, 2017 by Rex. Earlier this year, Alex Honnold scaled El Capitan without ropes. That was an impressive & dangerous feat by Alex. Alex once told me that he had never fallen completely unexpectedly—meaning without at least some prior inclination that it could happen. That is amazing and shows that Alex is simply operating at a higher level. I would make the blanket generalization that most climbers have fallen while climbing without anticipating it. Why this sticks out to me is when I apply it to other fields. Outdoor climbing can easily be a life or death ordeal. Software generally is not life or death during development. Can you imagine a programmer who writes code that doesn’t crash without the programmer having some prior inclination? That sounds impossible right? Or a slow development cycle. I’m not saying that programmers need to be able to anticipate every crash ever. But if someone were able to never have their code crash without prior inclination, that’s awesome. This entry was posted in Programming and tagged Alex, crash, crashing, ElCapitan, fall, falling, Honnold, inclination, prior on November 3, 2017 by Rex. I recently came across a short article on Uses This. Rob Pike talks about his setup. His response for his dream setup & having stateless devices really intrigued me. Twenty years ago, you expected a phone to be provided everywhere you went, and that phone worked the same everywhere. At a friend’s house, or a restaurant, or a hotel, or a pay phone, you could pick up the receiver and make a call. You didn’t carry a phone around with you; phones were part of the infrastructure. This is hard to imagine today or in the future for computers. A world where you didn’t have to carry around a mobile phone. You simply used the mobile phone wherever you went. For many reasons, what Rob talks about for phones (applied to computers) doesn’t seem likely. But it’s nice to imagine a world where you didn’t have to update your phone every couple of years. You could rely on a device at home or at work to pick up where you left off, without having to lug something expensive around and keep it charged. This entry was posted in Tech and tagged computer, distributed, phone, pike, rob on September 26, 2017 by Rex. I’ve been working with ARKit recently. I am planning on releasing an AR basketball game when iOS 11 is released. Working with ARKit means working with SceneKit. SceneKit is Apple’s framework to make working with 3D assets easier for developers. Working with SceneKit & 3D is something that I’m new to. A lot of the math around position, orientation, euler angles, transforms, etc. can get complex fast when it involves matrix transforms and quaternions. It’s really hard to find assets for DAE/collada. The DAE format is meant to be interchange format for various 3D software to communicate with each other. The reality is that exporting to DAE or converting from one format to DAE is a crapshoot. I’ve used Blender briefly to look at 3d assets, but digging into 3D modeling is a huge time sink for some one looking to get involved in ARKit. I wish there was an online store that focused on selling low poly (<10K), DAE files. Related, working with 3D assets as someone new to 3D assets is very frustrating. The concept of bounds vs scaling as they relate to importing into your SceneKit scene was very challenging (with the 3D model that I imported). If you have your own in-house or contracted 3D modeler, you should get 3D assets that work well with SceneKit, but I had countless issues with off the shelf 3D models & file formats. After you’re able to import your 3D model, modeling the physics geometry can be a challenge. SceneKit allows you to import the geometry for your physics body as-is using ConcavePolyhedron, but you probably don’t want that. I had to manually recreate a basketball hoop using multiple shapes combined into a single SCNNode. ARKit is not all powerful. The main feature that ARKit gives you is horizontal plane detection. Occlusion doesn’t come with ARKit. Expect many apps that deliver an experience reliant on a plane/surface like your desk or the floor. ARKit is exciting, but don’t expect the world yet. Future ARKit releases & better iOS hardware should provide more compelling experiences. Today, you can expect to play with 3D models on a surface (with surface interaction) or in the air (with limited or no environment interaction). This entry was posted in Tech and tagged ar, arkit, augmented, geometry, ios, physics, reality, scenekit, swift, xcode on August 31, 2017 by Rex. Something I came across recently was command line text manipulation with a CSV. The way that the list option is passed in is cool. If you wanted to save the output, the standard command line “>” comes in handy. The examples above are just for this demo, but I think the hyphen syntax in the list fields option is easy to learn and visually clear (for a CLI interface). This entry was posted in Programming and tagged cli, columns, csv, cut, fields, list, text on July 27, 2017 by Rex. I recently went on vacation in Europe. When I visit a new place, I try to get a feel for the new environment by walking around everywhere. Things like the OK to cross icon always amuse me since they are different. London has a ton of history (old buildings), but I found that it exceeded my expectations for modern accessibility. The signage throughout the subway and public areas (train stations, etc) was really easy to follow. In the UK, cars drive on the left side of the road. This is the opposite from the US. This means people coming from the US have to look on the other side for oncoming traffic while crossing the street. 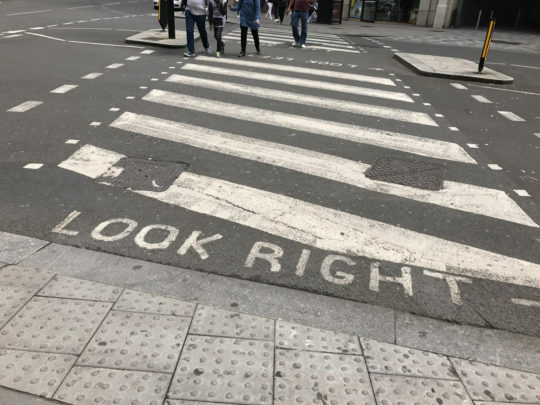 I appreciated these messages since they didn’t have to paint them throughout London. But they did and it helped me make sure I was looking the correct way for traffic. 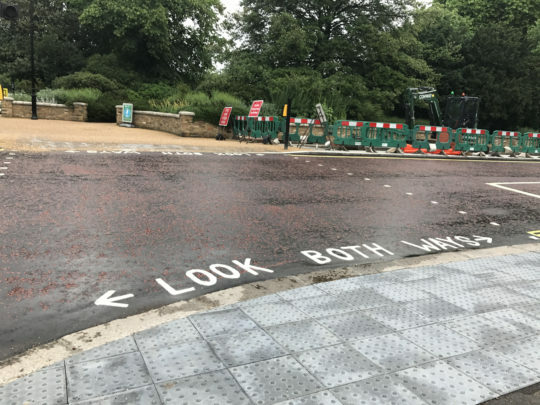 This entry was posted in Culture and tagged america, both, cars, europe, left, london, look, ped, pedestrian, right, traffic, uk, usa, walk on June 18, 2017 by Rex.